Go to the desert and wadis of the Middle East and the last thing you want to wear is hiking boots. However, such is the varied terrain facing you – from canyons, gorges and boulder-strewn river-beds to deserts, beaches and even mountain tracks – that any pair of sandals needs to be as sturdy as hell. Can Teva’s latest cut it? The Teva Fi Lite’s certainly grip onto one’s feet securely, with a full harness for ankle and toes joined by a sturdy link. A lot of you are going to be suspicious of the side-weighted link, which leaves the instep side of the foot bare to the elements, but in practice it makes little difference. 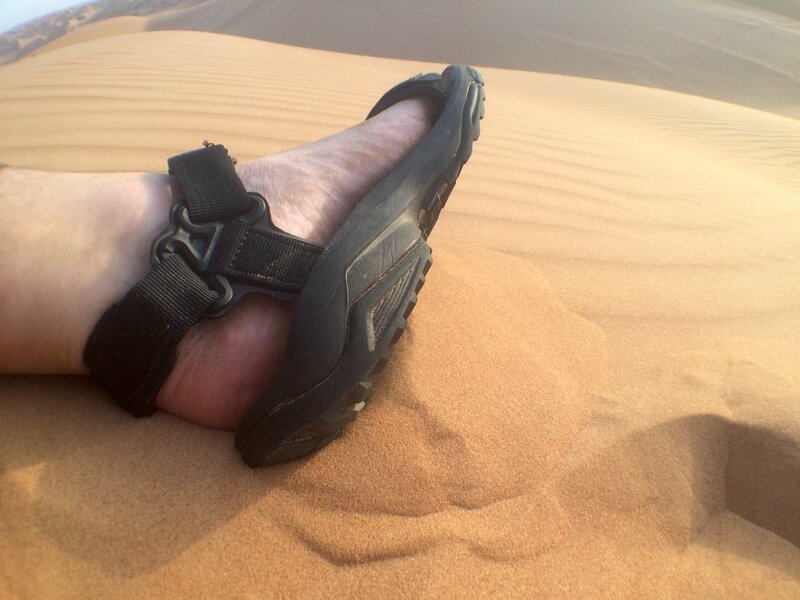 Ditto the open-toe design, though from long experience TravGear knows that anywhere you put an over-toe protector, you also collect a lot of sand and stones if you get anywhere near water. Travelling through multiple wadis and river-beds, streams, waterfalls and beaches, closed-toe just wasn’t going to work in Oman. The ‘spider’ sole grips well on dry rocks, but when it gets wet, there’s a chance of slipping. A hike up and down a tight canyon in Oman proved this beyond doubt, though we never felt that the sandal straps unusual positioning were to blame – it was definitely the sole. To be completely fair, wet boulders and scree is just about the toughest test there is for a pair of sandals. However, a couple of slips during the 3-hour walk let us feeling slightly nervous on the way back, which makes using hiking boots more likely next time. A good effort from Teva, whose toughly-made and easily adjustable sandals were great for general travel, but these are everyday wear rather than ready for anything sandals.